Twister is a big action thriller from the middle 1990s, produced by Steven Spielberg's Amblin' banner to compete in the summer blockbuster competition. It's inspired by the phenomenon of tornado chasers, researchers who go against their better instincts to try to get their recording instruments near erratic tornado funnel clouds. Beyond that, it's the perfect Spielberg popcorn picture: a fast moving, not-too-bright special effects extravaganza that doesn't allow credibility to interfere with its spirit of fantasy adventure. Spielberg's producers nailed director Jan de Bont, fresh from his smash hit Speed, the show that set the standard for brainless action filmmaking in the 1990s. The casting department hits a solid home run -- with stars on their way up and a score of capable supporting players, several of whom are now bigger names. Storm researcher Bill Harding (Bill Paxton) has accepted a job as a TV weatherman, and to marry his girlfriend Dr. Melissa Reeves, a therapist (Jami Gertz), must collect a signed divorce agreement from his ex, Dr. Jo Harding (Helen Hunt). Bill takes Melissa to get the signature on the very day that Jo and her team of techie-adventurers are about to try out a big experiment with 'Dorothy', a device that Bill came up with to loose dozens of data-transmitting chrome balls into the funnel of a tornado. Jo tricks Bill into helping with the day's storm chasing, as weather conditions are ripe for the formation of dozens of the dangerous storms. Melissa comes along too. Jo's team competes with a team led by Dr. Jonas Miller, a media-hogging copycat. Several attempts fail as the tornadoes cut a swath of destruction through Oklahoma, and Bill is pulled back into a life that he thought he'd left behind. Twister must have made a terrific story pitch. Michael Crichton and Anne-Marie Martin's script extrapolates on known weather science, giving Helen Hunt's character a very-90s 'personal' motivation for chasing storms: she lost her father to a twister, and is fighting back to learn enough to increase the tornado-threat warning time. The all-action story pauses more than once to allow for an Ahab-like oath or two, just so we'll know this is serious business. And of course, the movie's basic formula is pure Spielberg: A special effect happens, and the camera pushes in on awed faces, mouths agape. Spielberg must have reacted to the script's old-fashioned flavor. The jolly band of pro tornado jockeys behave somewhat like the oil team in The Abyss, playing rock music on the job and cultivating other personal eccentricities for our amusement. But Spielberg clearly saw the blatant borrowings from the world of Howard Hawks. The central gag of an ex pulling her mate back into the business he loves comes directly from His Girl Friday, complete with a clueless new fiancée to be shocked by her intended's fervor for his old line of work. The business of chasing storms for science is real and does have an element of risk. Twister treats it exactly like Hawks' Hatari!, in which big game hunter John Wayne chased Rhinos across Africa. Jo Harding's tight-formation caravan of crazy trucks tear-a**es across bumpy country roads at such a speed that they'd all end up in a ditch in just a few minutes. It all plays as an excuse for CDIM (Crazy Driving In Movies), and is the first definite sign that much of Twister is ABOH (A Bunch Of Hooey). 'Realism' is provided by a constant chatter of insider science jargon squawked truck to truck over the radio: "Look dudes, it's a Cone of Silence!" All this is in concert with a hi-tech weather station manned by NASA types on a caffeine jag, forever announcing yet another funnel formation coalescing right in the path of our dauntless heroes. Adding to the dumb-down factor is Cary Elwes' snarky, grandstanding scientific competition. In contrast to our heroes, Elwes' team of humorless musclemen drive matching black trucks and are rude. They're only in the movie to make Bill and Jo the underdogs, and to provide an audience-pleasing comeuppance scene. Somebody has to be seen getting the dirty end of the tornado, so to speak, so we can all shout in righteous approval. Twister really gets goofy in the details. Tornadoes are the definition of unpredictability, but Bill is able to intuit their intended paths by sniffing the air and playing with dirt, Tom Joad style. As unpredictable as they are, the tornadoes can get within yards of the research team, ripping away heavy tractors, trucks and bridges without doing the same to our heroes. I know that a tornado can play hopscotch through a housing tract, neatly obliterating only selected homes, but these twisters consistently fling farm equipment and live cows ("I think that's the same cow, actually") in front of the caravan, and the trucks are never as much as blown out of their driving lanes. It's the same thing we saw in the 90s movies that turned volcanoes into thrill rides, Volcano and Dante's Peak. In those pictures people were able to hop and skip around scorching lava floes with impunity. Twister's funnel clouds blow away entire towns, but our heroes can play freeze tag with them and walk away laughing. In reality, strapping one's self to an immobile object isn't going to help. Do you think a wind that blows away steel construction won't tear a human body into pieces? The movie really needs a disclaimer: "Warning: Nature is Nothing Like This." Heck, dozens of people drown each year trying to wade into floodwaters only three feet deep. Reality, dude, is like, uncompromising! The picture fills every moment with 'stuff' -- action, detail, business. Bill shouts out redundant & imbecilic orders like, "Hurry Up!" and "Run for it!" when everybody's already running for their lives. Nobody has time to use the outhouse before Dusty calls out "Surf's Up!" and it's time to chase another wind spout. Typical action: "Where's the truck?" (in answer, truck falls out of sky, crashing a few feet away.) "Whoa! Far out!" Other moments are pure pleasure, as when Melissa tries to dispense sensitive therapy (over an old, expensive radio phone) in the midst of a manic tornado chase. It's also difficult not to be tickled by the flying cow scene, if only for its Wizard of Oz appeal. Bill and Jo might have saved themselves a lot of effort if they simply attached sensor-radios to all the cows in Oklahoma. When they all go up the spout, they'd learn the same thing -- yep, things in tornado funnels go 'round and 'round. Twister is loaded with impressive effects scenes. The 1995-era CGI hasn't quite licked the blur factor (close-up tornadoes tend to look like the Tasmanian Devil in action) but the placement of the storms in live-action scenes is exemplary, especially when the POV is from a moving truck. Many physical effects are executed beautifully, including a 'drive a truck through a house' gag left over from 1941. Although the story is lighter than the chrome Xmas decorations that fly up into the funnel, Twister's humans are fun to watch thanks to spirited performances by Hunt, Paxton, Jami Gertz and their furry friends. The movie is like a lower-tier action B-picture from the old Warner Bros., goosed into a $60 million dollar extravaganza. Warners' Blu-ray disc of Twister is a polished presentation, an entertaining mass of noise and flying cows. The sharp picture gives us a much better look at the high-grade cinematography and expert stunt work, and the CGI effects in general hold up well under the increased resolution. Big close-ups of Helen Hunt and Jamie Gertz are very appealing at the enhanced level of detail. The high capacity of the Blu-ray format removes the necessity for a second disc for extras. Director Jan de Bont and effects supervisor Stefan Fangmeier share a commentary track. A slick new making-of featurette revisits the filming, along with an older HBO special with the same mission. Likewise, a featurette about recreating a twister with CGI is complemented by a History Channel docu about real tornado chasers. Their work is exciting enough, even without the Hatari- like drag racing through rural cornfields. It's a good reality check that counters the film's escapism with some sensible real-life meteorology, and is highly recommended. 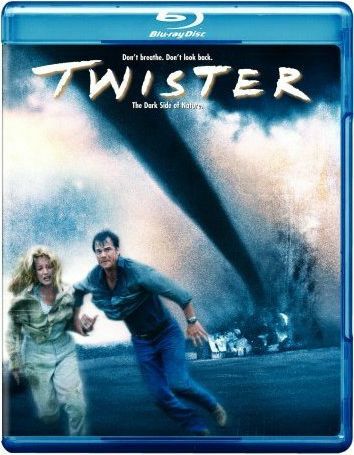 Twister has also been released on a double-disc standard DVD. 1. The ne plus ultra of this 'make it personal' baloney is to be found in the obnoxious 90s feel-good Sci-Fi film Contact, where we learn that all scientific ambition is really a secondary interest; super-astronomer Jodie Foster really wants to go to the stars to make contact with her deceased Daddy. What's on the other side of the Universe? Forrest Gump. The end of that movie is so insulting, I wanted to throw things at the screen. 2. Which means, I think, "something you're really gonna regret is gonna happen real soon."